Hosea must have been a citizen of the Northern Kingdom of Israel, and must have remained there permanently during the period of his prophetic activity; for "the land" (i. 2) means Israel, and "our king" (vii. 5) the king of the Northern Kingdom. According to the superscription of the book, Hosea was the son of Beeri, and, from what he says (i.-iii.) about his marriage, he had a wife who was faithless to him. When she fled from his house, he had to redeem her from the person into whose hands she had given herself. It has been assumed by some that this account has no historical basis, being merely an allegory. It is not, however, correct to maintain that the narrative is an allegory merely because the names can be interpreted allegorically, "Gomer the daughter of Diblaim" evidently meaning "destruction in consequence of idolatry" ( = properly, "cakes of figs," which according to iii 1 [ ] were offered as an oblation). There seems also to be intended an assonance with "Shomron bat Efrayim." The narrative must be regarded as historical, and the faithlessness of the woman as a fact. Hosea, however, knew nothing of her character at the time of his marriage, on the contrary, it was made manifest to him only afterward, as if through a special intervention of God, in order to serve to the prophet as a symbol of Israel's unfaithfulness to the Lord. 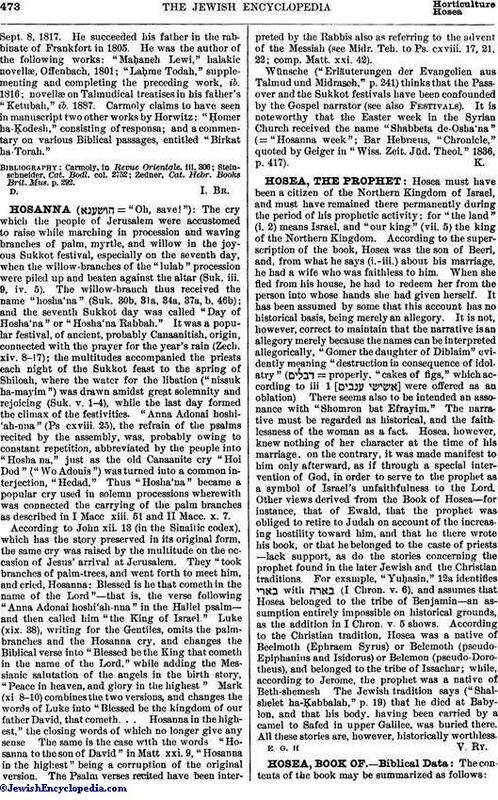 Other views derived from the Book of Hosea—for instance, that of Ewald, that the prophet was obliged to retire to Judah on account of the increasing hostility toward him, and that he there wrote his book, or that he belonged to the caste of priests—lack support, as do the stories concerning the prophet found in the later Jewish and the Christian traditions. For example, "Yuḥasin," 12a identifies with (I Chron. v. 6), and assumes that Hosea belonged to the tribe of Benjamin—an assumption entirely impossible on historical grounds, as the addition in I Chron. v. 5 shows. According to the Christian tradition, Hosea was a native of Beelmoth (Ephraem Syrus) or Belemoth (pseudo-Epiphanius and Isidorus) or Belemon (pseudo-Dorotheus), and belonged to the tribe of Issachar; while, according to Jerome, the prophet was a native of Beth-shemesh The Jewish tradition says ("Shalshelet ha-Ḳabbalah," p. 19) that he died at Babylon, and that his body, having been carried by a camel to Safed in upper Galilee, was buried there. All these stories are, however, historically worthless.